A group of Democratic Socialists and other angry protesters pursued Senate Majority Leader Mitch McConnell through a restaurant parking lot in Kentucky on Saturday, berating him with a mixture of immigration rhetoric and personal insults – and at one point an apparent threat to visit his home. The Louisville encounter was the second time in two weeks that McConnell’s private life has been disrupted by a spontaneous protest – and it was the latest in a weekslong series of confrontations between powerful Republicans and those eager to shame them on camera, wherever they are found. McConnell – who supports the Trump administration’s detention of families who illegally cross the border, but opposed the president’s short-lived policy of separating parents from their children – was having lunch Saturday at Bristol Bar & Grille, in his hometown. As it happened, hundreds of people were protesting outside Lousiville’s Immigration and Customs Enforcement Office, just a few miles from the restaurant. Among them were leaders of the local chapter of the Democratic Socialists of America, whose national fame has been growing since one of its members upset the Democratic incumbent in a New York primary last month. So when someone spotted McConnell at the restaurant and asked for help confronting him, the socialist group helped spread the word on social media. As McConnell’s party turned a corner into the parking lot, a woman with an ankle-length dress and a backpack tried to block their path. She walked a step ahead of the Senate’s top Republican, and the rest of the crowd followed close behind, still chanting and shouting. 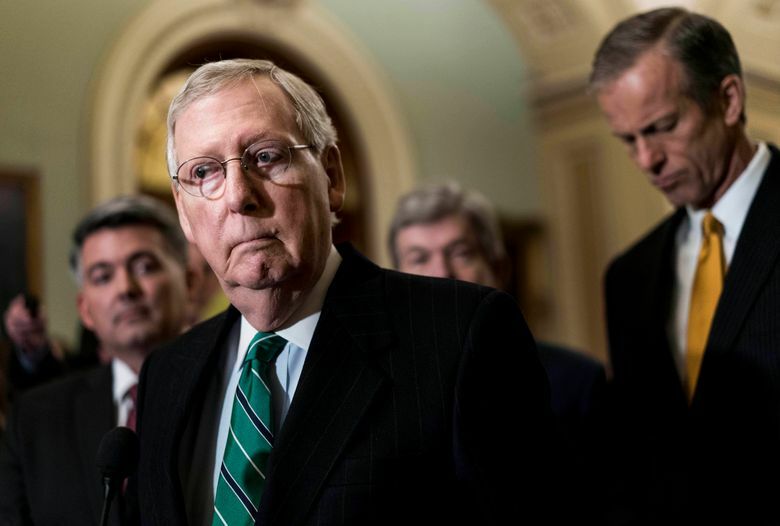 McConnell still said nothing; he simply climbed into the back seat of an SUV with a “Team Mitch” sticker on the window. The two other men (one of them a top state Republican, according to the Courier-Journal) got into the front, and the protesters could only shout at them as the engine fired up. “No comfort for fascists!” said the turtlehead man. “We did good, fellow citizens,” one of group congratulated the rest as the Highlander headed toward the alley. And true enough, video of the impromptu protest would be seen by hundreds of thousands of people, and make national news, and be praised by those on the left who think Trump’s allies deserve no peaceful meals while hundreds of migrant children are still being held from their parents. Now a few of the protesters stopped chanting after the departed majority leader and turned on this driver who would dare confront the confronters.